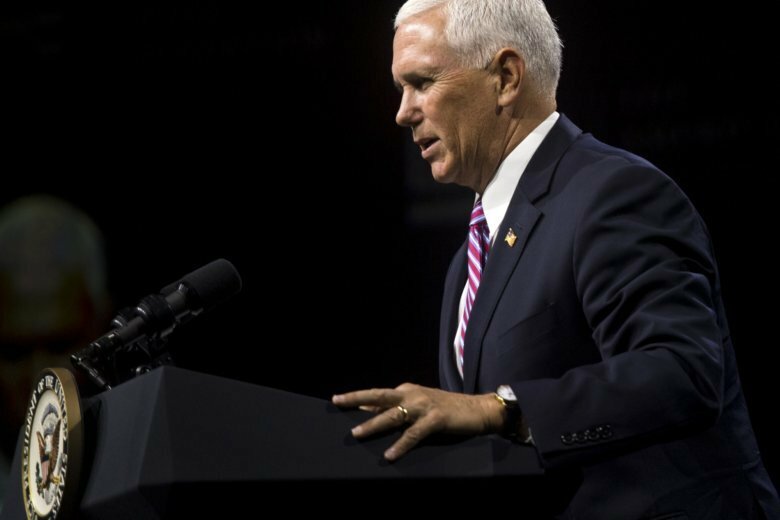 KNOXVILLE, Tenn. (AP) — Vice President Mike Pence on Friday told a crowd of conservatives in Tennessee that a win by Democrat Phil Bredesen would help the U.S. Senate become the center of the Democratic resistance. In the White House’s latest foray into the tight Tennessee contest, Pence contended that Bredesen would align with Minority Leader Chuck Schumer as Democrats seek to upend a slim Senate Republican majority. The vice president directed attendees to back Bredesen’s opponent, Republican Congresswoman Marsha Blackburn, calling her one of the strongest, most principled conservatives he’s met. Pence and President Donald Trump have headlined previous Tennessee events with Blackburn, as the GOP tries to boost her candidacy and undercut Bredesen’s message of political independence and continued popularity as a red-state Democrat who served as governor. Pence afterward headed to a Blackburn fundraiser Friday, also in Knoxville. Among his criticisms, Pence chided Bredesen for at one point describing Trump’s tax cuts as “crumbs” for the middle class and opposing the president’s U.S.-Mexico border wall proposal, which Bredesen has said is more political theater than practical policy. The vice president also acknowledged that Republicans face a real fight in November. On Friday, Bredesen’s campaign aimed to draw even more focus on his bipartisan appeal by releasing a TV ad that shows voters talking about being Republicans and supporting the ex-governor, and the campaign separately released their names. Blackburn’s campaign has already tried the opposite — a previous ad shows voters who say they supported Bredesen as governor, but now can’t get behind him for Senate. Bredesen’s campaign aimed to brush off Pence’s attacks. “Congresswoman Marsha Blackburn keeps bringing her D.C. friends to our state to tell voters what to think, but it is clear that Tennesseans want to turn things upside-down and tell Washington instead how we want to live,” Bredesen campaign spokeswoman Alyssa Hansen said. The event brought in other reinforcements for Blackburn. Chris Cox, executive director of the National Rifle Association’s Institute for Legislative Action, said Bredesen “might be a nice enough guy, he might make a decent senator for California or New Jersey, but not for this state.” The NRA, which endorsed Blackburn, has blasted Bredesen for running ad touting his support for the 2nd Amendment and mentioning his ‘A’ NRA rating as governor. The group says he now has a ‘D’ rating. “What we’ve seen just in the last week, the tidal wave of pushback to the appointment of a conservative judge that will help shape the future of our country in a positive way, what we’ve seen there is just a real reminder of how important it is that we have Marsha Blackburn as our next U.S. senator,” said Lee, who faces Democrat Karl Dean in the race to succeed Republican Gov. Bill Haslam.